Pakistan has decided to relax visa policy and allows 'Visa on Arrival' to the citizens of 50 countries. Groups of tourists from a number of tourism friendly nations are being offered Pakistani Visa on Arrival. While overall citizens of 175 countries can apply for Pakistani e-Visa service. This new move is a part of policy to make Pakistan open for foreign business and tourism which will increase foreign investment in Pakistan and tourism industry of the country will also flourish. IATA approved tour operators can now can now bring tourist groups to Pakistan under the new visa policy. Information minister Fawad Chaudhry told the media that Indian-origin British, US passport holders will also get on arrival visa. 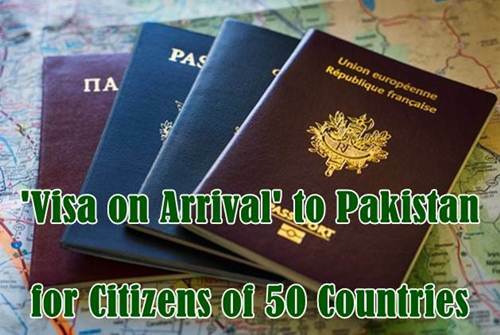 Citizens of these 50 countries will be able to get visas from the airport upon their arrival in Pakistan. If you are searching for a list of countries which don't ask visa from Pakistani passport holders, you should visit following page. Study visa will be granted for two years to students of bachelor degrees and four years to the students of masters degrees. Citizens of 50 countries may obtain visa on arrival for a maximum of 30 days, if they are travelling as part of a tourist group through an IATA approved tour operator. Pakistani Business visa on arrival will now be provided to citizens of 96 countries which was previously granted to only 67 countries. Citizens of following nations may get visa on arrival for a maximum stay of 30 days when they are travelling for business purpose. But in this case visitor must have a local sponsor who must first obtain an approval from the immigration authority with relevant documents. Citizens of following countries do not require a visa for entry to Pakistan. They can visit Pakistan with a valid passport of their country. Note: It is advised that you must get information from concerned government department of Pakistan or nearest embassy or foreign mission of Pakistan before planning to visit Pakistan.